The Morecambe Christelles Choir at The Church of the Ascension at Torrisholme in the early 1970s. The daughter of a popular conductor is organising a reunion in his memory. Susan Wilson is appealing for members of Morecambe’s Christelles Choir to come along to a reunion next month. The get together is not only to reconnect members and share memories but also a tribute to Jim Wilson, who died last year at the age of 85. Jim was the conductor for Christelles for more than 30 years after he founded the all-girl choir in 1969. After the group came to an end, Jim wrote a fond farewell speech for members. He said: “We shall all have happy memories of our 33 years. 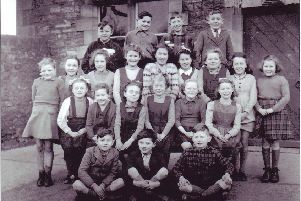 Jim Wilson with the Christelles Choir in Morecambe , dated around 1969. “Memories of eight wins at the Morecambe Music Festival, of eight pantomimes, of singing on alternate Sunday evening services (raising money for the church), of the Christmas Eve carol singing at the promenade hotels, of the yearly singing day at Clitheroe and the picnics and treasure hunts that followed, of the singing on BBC television ‘Songs of Praise’, of the presentation in church of ‘Jerusalem Joy’ and ‘Apostle’. “How these would have been such an inspiration today. “Appreciations and thanks to all those kind people who, over the years, have acted as presidents, served on the Chistelles Committee and most of all those who have played the piano. “To George and Hilda Shuttleworth, who made their farm available for our annual party before our summer breaks, and finally to our former ministers, George Waddington, Allen Fisher, Andrew and Carol Hill and Graham Vickers, who gave us support and commitment. Christelles began through Jim’s passion for music, explains daughter, Susan. “He played the organ for many years at Central Methodist Church, he always had a love for music,” said Susan, 54. “He thought the idea of an all-girls choir who would sing in services and represented the area would stand out. “He came across a lemonade bottle, I think it was called ‘Elles’ which is French for girls, he thought Christ and girls and came up with the name of Christelles. “He loved the choir, he did it as a full-time hobby, it was a commitment. “In the many years from 1970-90s he was 40 strong, he always had 40 girls, and they came and went. Jim set up the choir as a commitment to his faith and passion for music. The reunion is also calling for members of Rhapsodie – another choir group Jim ran for ten years. The reunion will take place on Saturday, May 19, at 7pm at Torrisholme Methodist Church and will also include a buffet. If you would like to attend and share your memories, please call Susan on 07778 694411.